I can remember a week during my junior year of high school when I thought that I’d never again be as busy as I was in those three or four days. I was constantly being reminded that my 11th grade performance would have a huge impact on my college plans, which only increased my stress level as I scrambled to finish essays, study for multiple exams and prepare for the SATs. It seemed as if there were not enough hours in the day to complete all of my assignments, so when the clock struck midnight and I felt I hadn’t prepared enough, I was faced with a dilemma. Do I chug a “5-hour energy” and get ready for an all-night study session, or do I go to bed right away and get at least a few good hours of sleep before resuming my studying in the morning? Personally, I’ve always preferred to go to bed at a reasonable hour and study early the next morning rather than opt for pulling an all-nighter. Some students may have a different mindset than I have when it comes to crunch time studying, but as my college career has advanced and the number of late night/early morning study sessions I’ve had has grown, I still wonder, which is the better study method for testing success? In a study conducted by researchers from UCLA, 535 LA high schoolers kept a diary for three 14 day periods, once in 9th grade, once in 10th grade, and again during their senior year. For each of the 14 research days students detailed how much time they spent studying, how much sleep they got at night and if they experienced any academic problems (poor grade on an exam, inability to comprehend class material) the following day. As many could’ve guessed, the study found that students who failed to get enough sleep had trouble comprehending class material the next day. In addition, the data showed that students who chose to bypass sleep and cram for their upcoming test tended to do much worse (on the test they spent all night studying for) than students who got an ideal amount of sleep (8.5-9.25 hours according to the National Sleep Foundation) the night before an exam. 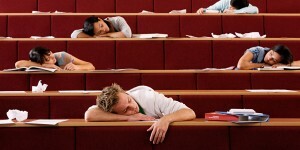 In this USA Today article [http://college.usatoday.com/2014/05/01/finals-week-prep-why-you-should-never-pull-an-all-nighter/], which is actually an excerpt from University of Miami professor Patrick O’Brien’s novel Making College Count, O’Brien asks, would a professional athlete deprive him or herself of sleep the night before a game? Would a politician go without sleep prior to an important speech? With the obvious answer being “of course not”, the author questions why a student would choose to do the same the night before a huge exam? Rather than stay up all night to study for a test, an idea O’Brien deems as “nothing short of crazy”, he says students should get a minimum of four hours of shut eye before diligently studying their best notes, not just quickly breezing through all course material. Additionally, O’Brien warns against consuming too much caffeine in an attempt to stay awake as overdoing it with the coffee or sodas can make students antsy and can actually hurt their focus. In one of his final pieces of advice, the author recommends that students look over their class notes in the 3-4 days leading up to an exam so that they can gauge their current understanding of the material and how much information they’ll have to know for the exam, rather than beginning to study the night before the test only to realize they don’t have enough time to cover all the information. Both O’Brien and the data from UCLA’s research study are consistent with the opinion of Dr. Philip Alapat, an assistant professor for Baylor University’s College of Medicine and the medical director of the Harris Health Sleep Disorders Center in Texas. Alapat feels that students need at least eight hours of sleep the night before a day of testing because sleep deprivation will negatively affect a student’s mood, focus, energy and ability to learn, which can obviously have ill effects on scholastic performance. It’s no secret that all people learn differently. For some students, getting out of bed in the early morning to study for an exam may be a next to impossible task. For these people, perhaps all night binge studying is the best study method. However, in my research for this blog I was unable to find a single doctor or scientist personally recommending that students stay up all night studying for an exam rather than getting a good night’s sleep. So, while I understand that this may not hold true for each and every student out there, the consensus is that spending a significant number of hours sleeping the night before an exam is much more conducive to earning an “A” than pulling an all-nighter is. This is good news for me, as I’m also the kind of person who prefers sleeping to staying up and studying. I agree with O’Brien as it simply doesn’t make sense to stay up all night cramming before a big test. All you’re doing is making yourself extremely fatigued and therefore less likely to perform well. One of my blog posts was about naps, but in doing research for that I found sites and studies that lauded sleep for how restorative it is. I really liked your use of that study, as I feel like it really legitimized your argument. This is a very important post for all students to inform themselves more about. While I understand what O’Brien says on his point about common sense regarding sleep with politicians and athletes, I personally think it is different when it comes to students. The pressure is similar, but as a student I understand that each minute that he/she could spend sleeping, he/she will feel guilty knowing time is passing and they could be getting work done instead of pushing it further into the future. When it gets to a certain point, regarding studying, it is not necessarily worth it to lose a lot of sleep attempting to retain last minute information. I really enjoyed reading this post and I hope more students begin to make their sleep a priority since it has a huge impact on life and health.